The easy answer—and the most straightforward answer—to why we should make disciples is “because Jesus told us to do so.” I mea n, that should be enough, shouldn’t it? What exactly is happening when a person becomes a disciple of Jesus? And here we need to understand that every single human being on this planet—all who have ever lived and all who ever will live—every single one of us are born “on the wrong side of the tracks”—spiritually speaking. The Bible teaches us that at one time we were all “by nature children of wrath” (Eph 2:3), and we were spiritually dead in our trespasses (Eph 2:5). Our sin had separated us from God so that there was a wall between us and God (Isa 59:1–2). We all deserved God’s wrath to be poured out on us. We weren’t innocent—not one of us. We have earned his righteous wrath (Rom 6:23). But God in his grace sent his Son into the world. His Son lived a perfect life. His Son was innocent in every sense of that word. And then that innocent Son went to the cross to bear the penalty that we owed for our sin. As he died on that cross, he wasn’t dying for his sin—remember, he was innocent. No, he was dying for our sins. He was paying the price that we owe. And then after he died, he was buried, and on the third day he rose victoriously from the grave and defeated even sin, death, and the devil. So, let’s return to the original question. 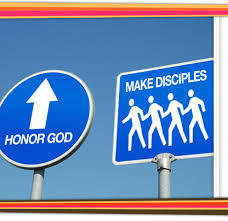 Why do we make disciples? Yes, we do it because God told us to, but more a important “big picture” answer. The reason we make disciples is because this is the way God rescues sinners from the punishment they deserve. When you speak to “Unbelieving Bob” about Christ, and Bob turns from his sins and trusts in Christ, let me tell you what just happened. At that moment when Bob trusts in Christ, God rescued him from an eternal hell. The reason we make disciples is because it’s God’s means of rescuing lost sinners into a relationship with him. Do you know any sinners in need of rescue? This entry was posted in Discipleship, Evangelism, Spiritual Formation. Bookmark the permalink.